On an unrelated note, why am I not being invited to any parties lately? So I'm turning my focus back to my own “nutritional opportunities.” And believe me, 2 decades of SAD-ing, a few years of conventional medicine-ing and a good 5 years of crash dieting have left some “opportunities” that seat-of-the-pants Paleo doesn't decisively target. I'm working on my digestion and gut flora and, as you may have read, my skin. Rectifying longstanding issues takes “stra-tee-gery” and super-nourishing foods like marrow, broth, liver, fermented foods, and butter oil. I've found that I'm quite deficient in zinc, which is a pretty key nutrient with a hand in nearly everything I'm trying to optimize – from my skin to my gut health. Since I'm not big on pill-style supplementation, I have chosen to rectify both my zinc deficiency and my “slimy stinky ocean food deficiency” at the same time. Plain English: I've decided it's time to eat oysters more often. 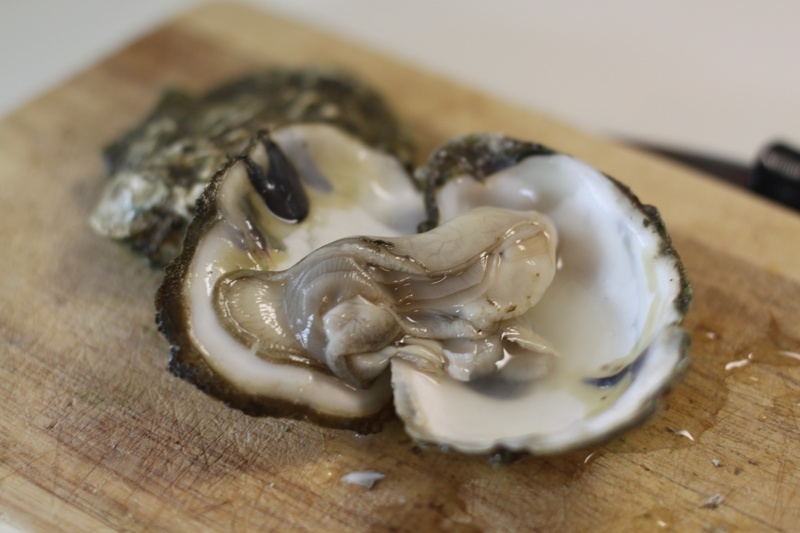 Oysters have more than FIFTEEN TIMES the zinc of the next-closest food (beef) and I want to work more seafood into my diet. Whine: I have never warmed up to eating oysters. Oysters are for ONE thing, and ONE THING ONLY: outfitting mermaid chesticles. Anyhow, I learned to like (as in, live with) Cod Liver Oil and organ meats, so I assume I can learn to like oysters too. But I'm unsure about the way we're suppose to eat 'em: like nutritional supplements. Of course, I also add some extra avoidance rituatls: nose pinched, eyes squeezed shut, huge swig of lemon water – which I know is a total waste. Right? Or is that pretty much what all the snooty Georgetown yuppies at Hank's Oyster Bar are doing over their Pomengranate this-and-thats? It depends on the type of oyster, for one, so I would recommend trying different ones to see if you can find some varieties you like. Also, this is not the best time of year to be learning to like oysters; they say one should really only eat raw oysters in months that have an “r” in them. So maybe try again in September? Lastly, I find that cocktail sauce helps A LOT — but you’ll have to make your own, to avoid all the non-paleo stuff in the pre-made stuff. Good luck! I used to think they were disgusting but have since developed a fond appreciation for them. Canned oysters?? That might be an option instead of raw. TELL ME when you find a way to make them ok!! I’ve never tried them. I almost did in college, but a friend lovingly shared an observation that oysters looked like little labias and clitorises–clitori? That was it for me. But I’m needing to give it another go. Fried in coconut oil? HYSTERICAL. I have no advice since I can only eat them Rockefeller, and that’s terrible advice, paleo-wise. And really- it doesn’t feel any better hearing that you’re “totally Samantha”. Promise. Ha! Oh man…point well made! 1. I want that Vegan shirt baaaaaaaaad. 2. I flocking LOVE oysters so it’s possible I’m not the best person to comment, because all I have to say about it is: if you don’t like them, can i have yours?? Pretty please? We’re going to have to figure something out. I’ll eat your oysters (dirty!) and you can remind me why I can’t have sugar. Thank you … I’ve wondered the very same thing myself! I’m kinda thinking that going the Oysters Rockefeller route (or similar) may need to be involved. I’m guessing a bunch of beer to wash them down might defeat the purpose, right? If you come over and we serve oysters with beer chasers I won’t tell anyone, I promise. Ahhhh how I LOVE oysters! And I always turned m nose away from them until I went to an oyster bar and had my very first one…. the first thought that came to my mind was, “why did I wait sooo long?” My ex is from El Salvador and he was the one to turn me on to them. So I ate them his way and it’s the only way I eat them. 2 drops of Tabasco sauce, a good squirt of fresh lime and a small shake of salt. Open up and slide them in. I even find amongst the dozen oysters on the plate the one that has the “perfect” shell and use that same shell for all. By the way, mermaids use scallop shells. Oooooh, scallops, yummm. Several years ago I was eating a raw version of paleo and so I ate a whole lot of raw seafood for a while. It was then that I started to develop a taste for raw oysters. So, I’d say get your taste buds and texture buds warmed up to the gooyness of raw seafood and you’ll find yourself an oyster connoisseur in 3 months! I add boiled or smoked ones to various soups. I also use them with raw organic nori sheets and sauerkraut to make sushi rolls. In culinary school the old standby was mignonette sauce. Pour a bunch on and drink them down. Then drink the rest of the mignonette, because it’s super delicious. I once fried some oysters (wasn’t comfortable about the source for eating them raw) rolled in shredded coconut, in coconut oil. Those were actually pretty delicious. Try that. Add some salt after frying for a more restaurant-like fried greasy deliciousness. Best blog yet! I almost laughed! My dad and I used to like oyster stew. But that was when dinosaurs roamed the earth, pre-paleo. +1 on the vegan tee shirt. Also, I wouldn’t mind reading about the digestive bitters, as you are the first paleo blogger who I’ve seen mention them. How about sea vegetables, wouldn’t they supply a bunch of zinc and beneficial minerals? Have you tried bbq’d oysters – there EASY, good and very cave girl like to eat! Take clean, whole oyters in the shell and cook them on top of a hot BBQ grill until they pop open. Remove the top shell, add a sqeeze of lime and a splash of your favorite hot sauce and slurp it down. Two words: Butter + Tabasco. They DO look like those chicken cutlets that you put in bras! Can you make CaveGirlEats t-shirts? We can all meet up in our t-shirts at Hanks! I’d like to see those Georgetown kids role their eyes. Hell yes! Maybe I’ll actually do a little giveaway for the first person to tattoo the logo across their forehead. I got my husband to eat them with lots of cocktail sauce (heavy on the horseradish). As time went on he eased up on the sauce and now enjoys them condiment free. Despite being a girly girl it was the disgusting look and slimy texture that made me love raw oysters at the tender age of 5. Nothing says frilly dressed princess like slimy, gray, raw foods. Hot sauce helps a bunch! Also, Zinc is huge in hair care, Nolen is/was actually zinc deficient as well and our clue to his lack of zinc was excessive hair loss. Fixing his by zinc-loading isn’t an option seeing as most of the top 10 high zinc foods aren’t baby friendly (possible allergy issues with seafood/shell fish). We have been doing roasted chickpeas (very finger food friendly, and can be roasted in the oven with evoo (or oil of your choice) and sprinkled with salt and pepper). We are no longer rocking the comb over. “We are no longer rocking the comb over.” I love it! What do you think about where you get your oysters from or any concerns about their previous environmental exposures? I’m not real keen on eating the street-cleaners of the sea(or land like snails) but eating a chicken that ate grubs is easier for me to palate than what oysters, shrimp, and scallops are taking in. Haha, I can see your point. I was getting oysters from Vital Choice for awhile, but now they’ve run out! Not sure how I feel about it, and I won’t eat shrimp for that same reason…yet I’ll eat scallops when forced. I’ve NEVER been a fan of oysters, but I just got a tin of smoked oysters from Trader Joes and hid them in Melissa Joulwans silky gingered zuchinni soup. Have to say I enjoyed them and chewed them fairly well. Still don’t think I could do it with sardines.